Disease heterogeneity, a hypoxic and acidic tumor microenvironment lacking in nutrients, and the associated presence and activity of cancer stem cells (or tumor-initiating cells) combine to make the treatment of the common adult brain tumor glioblastoma a difficult proposition . Of note, tumor-initiating cells contribute to the vascularization of glioblastomas through the secretion of various pro-angiogenic factors [2, 3], although currently developed therapies targeting this activity have failed in the clinics. These disappointments have prompted the search for another target, with researchers at the laboratory of Anita B. Hjelmeland (University of Alabama at Birmingham, Birmingham, Alabama, USA) recently settling on an epigenetic modifier that binds to methylated histone H3 lysine 4 to modulate gene expression: the chromodomain helicase DNA‐binding protein 7 (CHD7) . Importantly, worse prognosis in a subset of medulloblastoma patients correlates to reduced CHD7 levels , while reports have highlighted a role for CHD7 in the transcriptional repression of the pro-angiogenic vascular endothelial growth factor (VEGF) gene [6, 7]. In their recent STEM CELLS article , Boyd et al. now report that the hypoxia/pH levels in the tumor microenvironment can inhibit CHD7 expression in tumor-initiating cells, which prompts a pro-angiogenic response. The authors expect that these findings may have relevance for the enhanced therapeutic targeting of glioblastomas. The team discovered CHD7 when cross-referencing genes whose expression correlated with worse glioblastoma patient survival and genes consistently altered upon exposure of multiple patient-derived tumor-initiating cells with acidic pH or hypoxia. Subsequent database and literature searches confirmed that lower CHD7 expression associated with increased tumor aggressivity, while neural progenitors and non‐neoplastic brain display higher levels of CHD7 in comparison. To delineate the transcriptional consequences of CHD7 loss, the authors silenced CHD7 expression via short hairpin (sh)RNAs in neural progenitor cells and a tumor-initiating cell line displaying relatively high levels of CHD7. Overall, the gene profiles generated indicated the modulation of multiple angiogenesis‐related pathways, with decorin, platelet‐derived growth factor delta, chitinase 3‐like protein 1, and tropomodulin 1 representing the top angiogenesis-related hits altered in the same direction in both cell types. To investigate angiogenesis further, the authors then cocultured tumor-initiating cells with brain microvascular or umbilical vein endothelial cells and assessed for tube forming potential. In agreement with previous findings, reduced CHD7 levels led to increased endothelial tube length and number of segments indicative of elevated angiogenic potential. Furthermore, an orthotopic model of glioblastoma employing tumor-initiating cells expressing a CHD7 shRNA displayed dramatic increases in collapsed and malformed blood vessels and increases in areas of thrombosis within the brain tumors. Overall, this body of work links the hypoxic and acidic pH microenvironment of glioblastoma with lower CHD7 expression and higher angiogenesis, and the authors now hope to continue this line of research by investigating whether perinatal asphyxia and resulting developmental delays correlate with changes in CHD7 levels. Overall, the team anticipates that their findings will aid the development of novel treatments for glioblastoma as well as for other conditions, such as stroke or aneurysm. For more on tumor-initiating cells and the development of new targets for glioblastoma, stay tuned to the Stem Cells Portal! Wen PY and Kesari S, Malignant gliomas in adults. New England Journal of Medicine 2008;359:492-507. Bao S, Wu Q, Sathornsumetee S, et al., Stem cell-like glioma cells promote tumor angiogenesis through vascular endothelial growth factor. Cancer Research 2006;66:7843-8. Hamerlik P, Lathia JD, Rasmussen R, et al., Autocrine VEGF-VEGFR2-Neuropilin-1 signaling promotes glioma stem-like cell viability and tumor growth. Journal of Experimental Medicine 2012;209:507-20. Schnetz MP, Bartels CF, Shastri K, et al., Genomic distribution of CHD7 on chromatin tracks H3K4 methylation patterns. Genome Research 2009;19:590-601. Badodi S, Dubuc A, Zhang X, et al., Convergence of BMI1 and CHD7 on ERK Signaling in Medulloblastoma. Cell Reports 2017;21:2772-2784. Schnetz MP, Handoko L, Akhtar-Zaidi B, et al., CHD7 targets active gene enhancer elements to modulate ES cell-specific gene expression. PLoS Genetics 2010;6:e1001023. Engelen E, Akinci U, Bryne JC, et al., Sox2 cooperates with Chd7 to regulate genes that are mutated in human syndromes. Nature Genetics 2011;43:607-11. 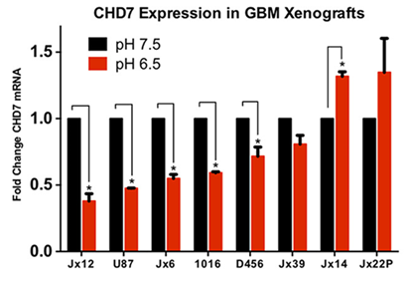 Boyd NH, Walker K, Ayokanmbi A, et al., Chromodomain Helicase DNA-Binding Protein 7 Is Suppressed in the Perinecrotic/Ischemic Microenvironment and Is a Novel Regulator of Glioblastoma Angiogenesis. STEM CELLS 2019;37:453-462.